We are steadily approaching the 2018 holiday season! 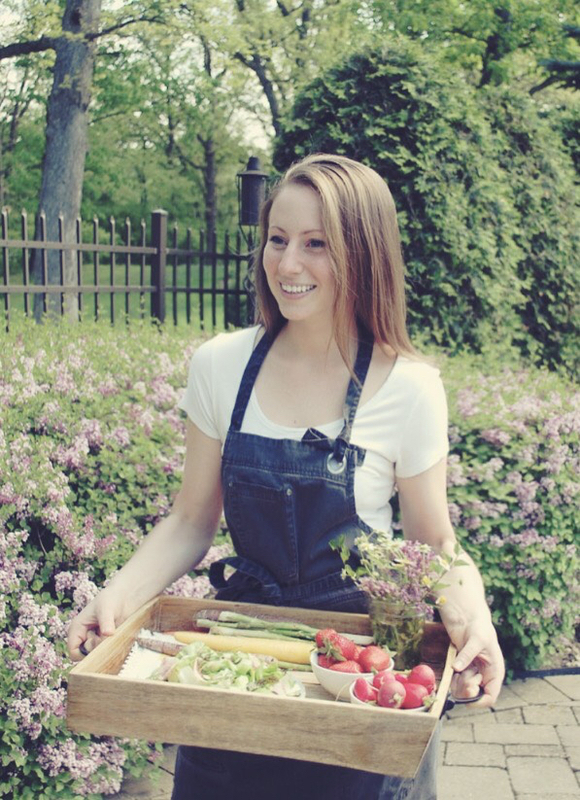 And that means, it’s time to start compiling our holiday side dishes for all of the festive gatherings coming our way. I simply cannot wait. 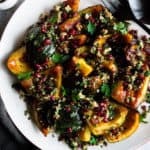 And I’d say this caramelized acorn squash with walnut & pomegranate gremolata will keep things extra exciting this year. I’ve got a fair share of favorite holiday side dishes, from baked mac & cheese to cornbread muffins and italian sausage stuffing. I wanted to add a vegetable dish to the mix for something light and full of flavor. 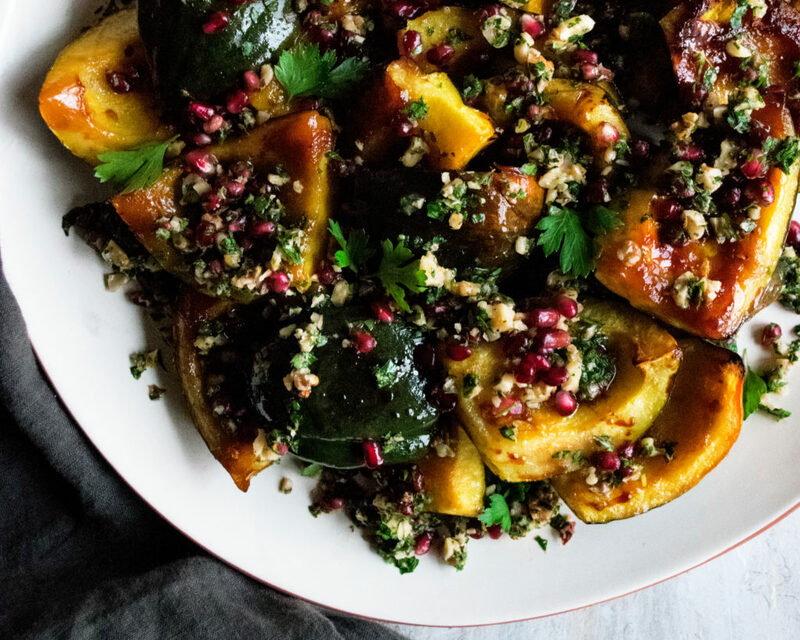 I give you…caramelized acorn squash with the most festive, and flavorful, topping! Gremolata, if you’ve never heard of it, is a chopped herb condiment. You’ll usually find notes of garlic, lemon zest, and anchovies. For my fall version, I’ve rounded out the flavors and made it a little sweeter by adding fresh oregano, toasted walnuts, and pomegranate seeds. The squash itself is simple to make. You’ll first reduce a mixture of cider, honey, and soy sauce down until it’s syrupy. 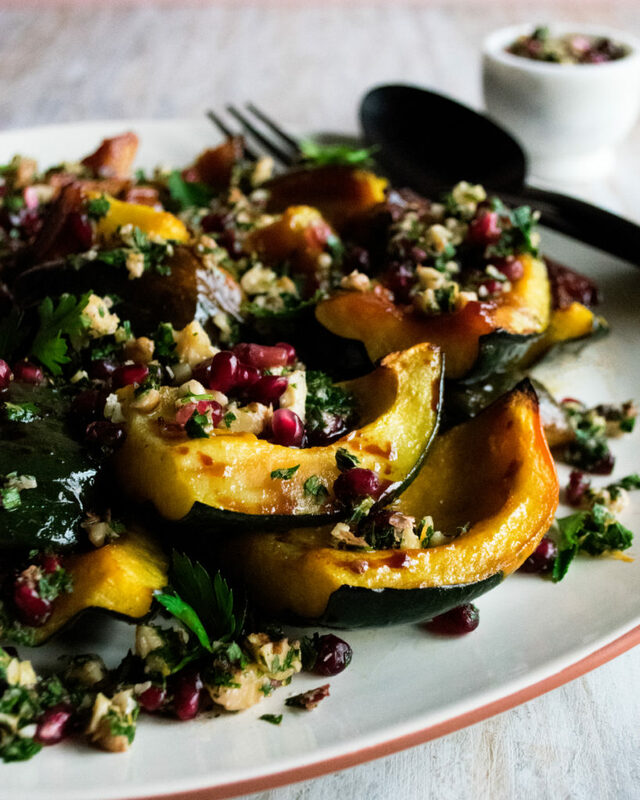 This glaze will coat the squash as it roasts, creating a velvety finish as it caramelizes. It’s very fresh, yet rich at the same time. Then, the gremolata gets sprinkled (very generously) over top to add a textural element that brings it all together. Keep this one in your pockets, everyone! I’d say it’ll sure look good on your Thanksgiving table. Enjoy! 1. In a small saucepan, combine the apple cider, honey, soy sauce, and sprig of rosemary. Bring to a boil over medium heat. Reduce the heat to medium-low and simmer for about 20 minutes until syrupy and glaze-like. 2. Meanwhile, preheat the oven to 425F. 3. 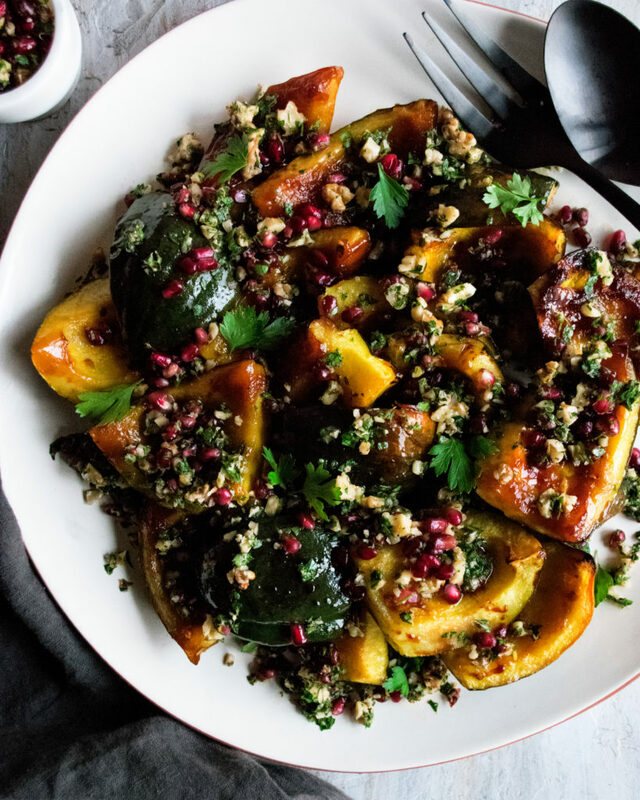 Toss the acorn squash in a large bowl and drizzle in a light coating of oil. 4. Once the glaze has thickened, add it to the squash. Toss well. Spread the squash out onto a foil-lined sheet pan in one, even layer. Season the squash with a pinch of salt. 5. Roast for about 25 minutes, or until caramelized and tender. 6. Remove the squash from the oven and transfer to a platter. Spoon all of the glaze over top. 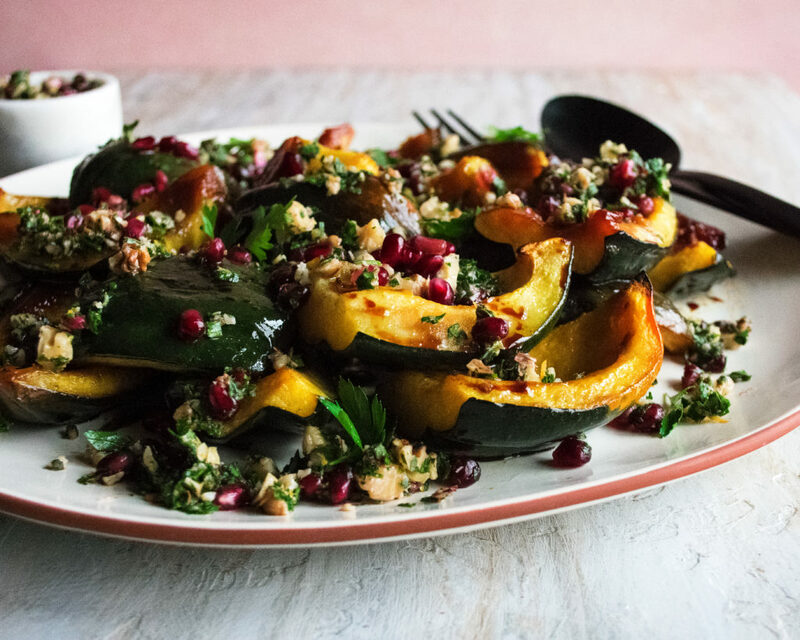 Garnish with a generous amount of the walnut & pomegranate gremolata. 1. In a small mixing bowl, combine the parsley, oregano, lemon zest, lemon juice, toasted walnuts, and pomegranate seeds.